The Stratus 6 Tree is six feet standard height, which makes the jump from level to level twelve inches, which is best if jumping up and down is an issue. The seven foot model has a thirteen inch jump-up. The standard tree has one small, one medium and four large dishes, which can be upgraded to four leaves, four small flowers or four large flowers. Two of the four upper levels can have clamshells. Note that the levels spin on and off so the location can be varied easily. 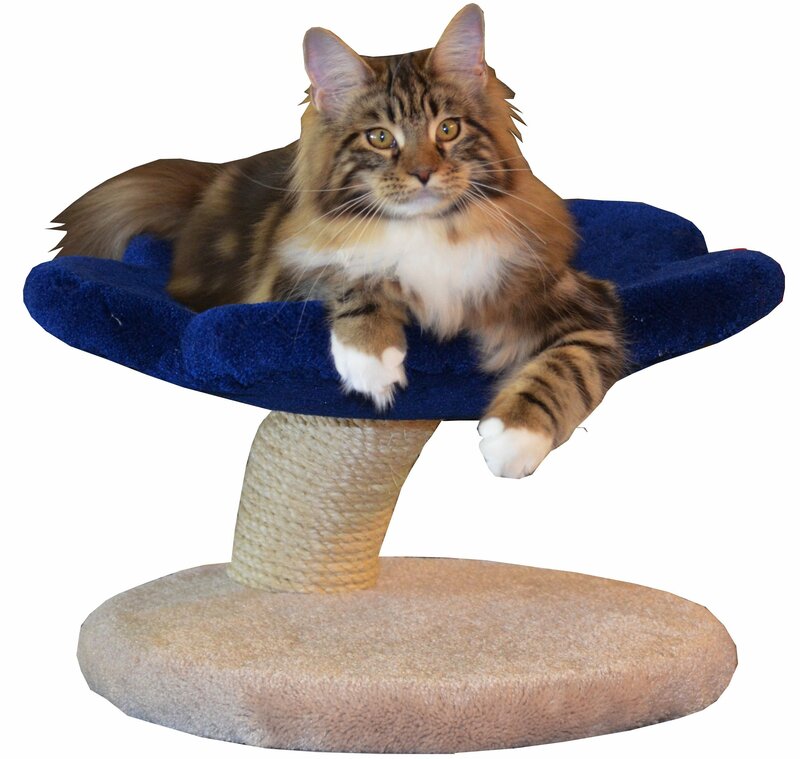 If the top level is not a clamshell, putting a clamshell on the second level will put the "roof" close to the top level and the cats can playe easily. Having a clamshell on the top level will add ten inches to the height of the tree. Certain Stratus Tree models are offered with Cedar Flats platforms. They make an excellent Outdoor Tree but, by adding sisal rope to the trunk, it can be also used indoors as a "near" hypoallergenic tree. Please refer to All Wood Products for details. Large Levels - you may choose dishes, leaves, small flowers or large flowers. These are the levels between the fixed small and medium dishes lowest on the tree tree and the top. Tall - will add 12 inches to the height of your tree and the levels will be redistributed evenly up the trunk. Primary Colour - is the colour of the base and all levels of your tree unless you make optional colour choices. Base Colour or Wood Finish - gives you the option of staying with your Primary Colour or choosing a different colour or wood finish for the base. Top Choice - is where you choose what goes on the very top of your tree. Top Colour - again, you may stay with the Primary Colour or the top most level of your Tree Structure can have a different colour of your choice. Extra Clamshell - provides an option to replace 1 Large Level with a Clamshell. You may match the Primary Colour or the Top Colour. Hammocks Option - can add a new look to your tree by including one or two hammocks for your cats to lounge on. Ramps Option - allows you to add a set of ramps to your tree which may help older or infirm cats use the tree more. Ramps Colour - choose a nice contrasting colour for your Ramps or stay with the Primary Colour for a more homogeneous look.